We’ve been adding to our AUTHOR PAGES of late. 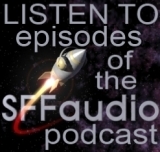 Just added, FREDERIK POHL – which lists everything audio, that we know about, that’s related to SFWA Grand Master Frederik Pohl. There’s an interview, a convention panel, a radio drama and of course audiobooks listed. Yum yum!